As the presidential campaign reaches a fever pitch, few voters are likely to pause and question why Democrats are associated with the color blue and Republicans with red. It’s just always been that way — or has it? You might be surprised to learn that these color associations manifested somewhat recently — in the 2000 election, to be exact. Before then, the colors were not set in stone and were even reversed in certain press venues in past years. Then came the lengthy contest between George Bush and Al Gore in 2000, which wasn’t fully decided until December of that year. 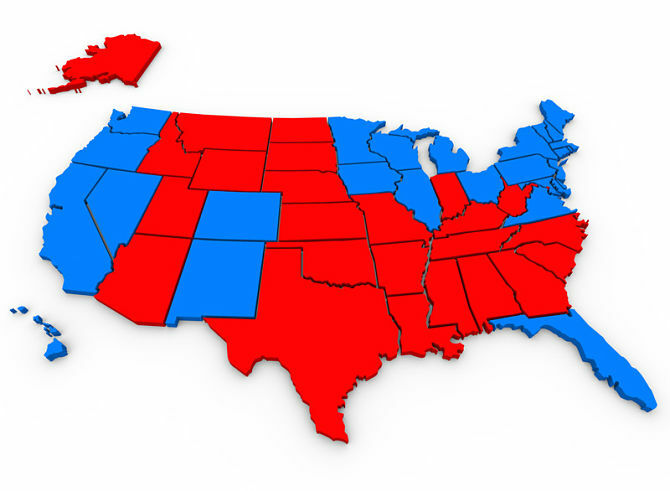 During this time, television news stations used the color red on United States maps to denote Republican-voting areas, and blue was used for Democrat-leaning states. We all know how that contest ended. However, the color coding for Democrats and Republicans has stuck, and is showing no signs of changing. Just like the iconic Donkey and Elephant, these anchors to each party seem here to stay. On the face if it, in some ways, the colors for each party seem like they should be reversed. After all, red tends to be associated with fiery, active qualities, and blue with more serene, sedate and conservative tendencies. However, red is also a color of strength and ambition, which most certainly applies to how most Republicans view themselves. It has traditionally been the party of the wealthy and the elite, pushing forward lofty financial agendas while not as active in matters of social justice. Pushed to extremes, red can indicate aggression and abruptness, which some Democrats might assert about Republicans. Red may also indicate a tendency to “pass the buck” and push forward assertively, perhaps with a selfish motive. However, the conservative party would likely insist that they are just trying to get all they can out of life, which is another trait associated with the color red. Red is arguably the most vibrant color on the color wheel. It is attention-getting and induces a sense of power and excitement. For these reasons, some Democrats lamented the fact that Republicans became associated with this dynamic color instead of their own party. However, others resonate with the values associated with the color blue being connected with Democratic ideals. Serene and reassuring, the color blue is indicates a deliberate and at times introspective nature. Blue is thoughtful, caring and steadfast. It is connected with expertise and trustworthiness. It also happens to be the color that tends to chosen as favorite of the majority of people around the world. While blue is often associated with conservative movements, values and corporations, it is also connected with duty, patience and perseverance. Blue is associated with wisdom and a solid character, which some might connect with Democratic ideals. Most Democrats strive to work hard for all people regardless of socioeconomic class. On the downside, blue has been associated with being inflexible and overly sensitive, which is how some Republicans might perceive and label Democrats. People who gravitate toward blue tend to be easy going and charming, and charisma has certainly been a draw of many noteworthy Democratic candidates. So, are you stimulated by the vibrant power and optimism of Republican red, or are you drawn to capable, trustworthy and cool Democratic blue? We are continually influenced by color and the associated vibrations, whether we are aware of it or not. What do the colors red and blue stir up in you? Do you automatically associate a color with your favorite political party? Being aware of the effects of color on the human mind can allow us to think more independently while still enjoying the abundant visual stimuli all around us. Be mindful of the influence of political advertising this election season, and use your intuition and your heart when making your final decision.